Instructions: This draft is specifically for Two or Three-Footers, but can easily be adapted for Seven-Footers by changing the amounts. Feel free to customize it as necessary. Wherever you see [**] it refers to the name of your church or project. Copy and paste the following into your word processor where you can edit and send it to your prospective sponsors. Or, you can print it and hand it out in person. It is intended to be an email so the recipient can click on the links and picture. If you print and mail it, you will want to include the close-up of the rim sticker that is linked from the picture. You might need to modify the font, margins, or shrink the photo to fit on one page. If you have any questions or would like help customizing your invitation, please don't hesitate to contact us. We would like to add a Spiral Wishing Well to our [**] to raise much-needed revenue for [name the project or fund if different]. You have probably seen these exciting coin funnels in museums, zoos, stores, and [name a category like yours] where they raise thousands of dollars per year. 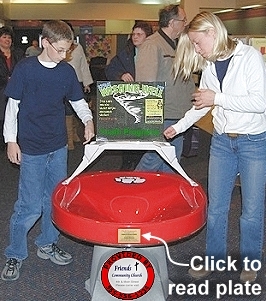 Children and adults love to toss coins in and watch them spin around the funnel seeming to defy the laws of gravity, faster and faster as they descend the nearly vertical walls of the vortex. If you haven’t seen them before, there are pictures, descriptions, and video clips on www.spiralwishingwells.com. We know a Well will be a great addition to our [**]. Our challenge is that we don’t have room in the budget for the initial cost, and would like to ask you if you would be willing to sponsor the Well for us? We have already qualified for an assistance grant that pays $500 of the cost if we are able to order before their fund is depleted. So we need a local sponsor to cover the balance which would be [specify the amount you want sponsored. You can include shipping and the $45 cost of the brass-like rim sticker…]. 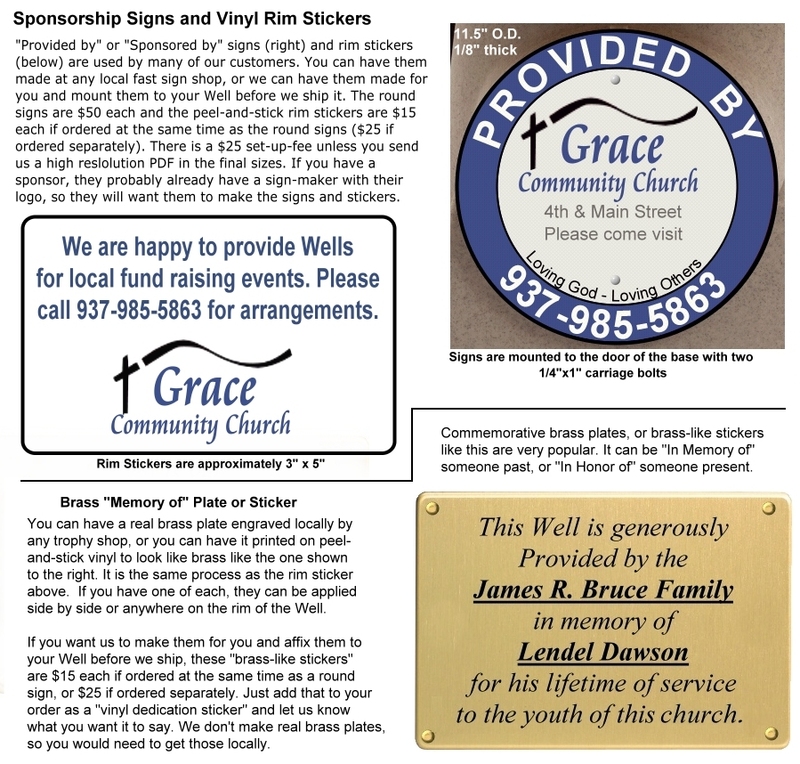 In gratitude for your sponsorship, we will include permanent recognition on the rim of the Well like the brass-like plate in the lower left corner of the above picture. The wording can be customized to fit your wishes. If you want to dedicate your sponsorship to someone past or present, that can be included. Spiral Wishing Wells generate a lot more than their cost. So your sponsorship will be “leveraged” to a much larger amount as the months and years go by. If you do it as a family, it will be a great legacy for your children to know they have a part in helping [**]. We will keep you posted with an annual report so you know what your generous gift is doing for [**]. Also, when the Well arrives and is put in place, we would like you and your family to join us to be part of the unveiling and kick off. In order for your sponsorship to be tax deductible, you will want to write a check to the church. Then we will purchase the Well directly. The manufacturer has a relationship with a national grant organization called, “Project Kindness” who will pay $500 of the cost until the fund is depleted. So we need to move quickly. Therefore, I hope that you are able to make a favorable decision right away. I appreciate so much your ongoing enthusiasm and support for the church, and for considering this special sponsorship opportunity. If you have any questions, please don’t hesitate to ask.